You’ve come to the bazaar and set up your stand, putting out all your precious goods. You look across from you… see your competitor. Watching him slash the prices on some of his wares to undercut you while you know he’s trying to buy all the stock of other fine antiquities so he can have the monopoly. You see the smug look on his face… and you know that you have to take him down. 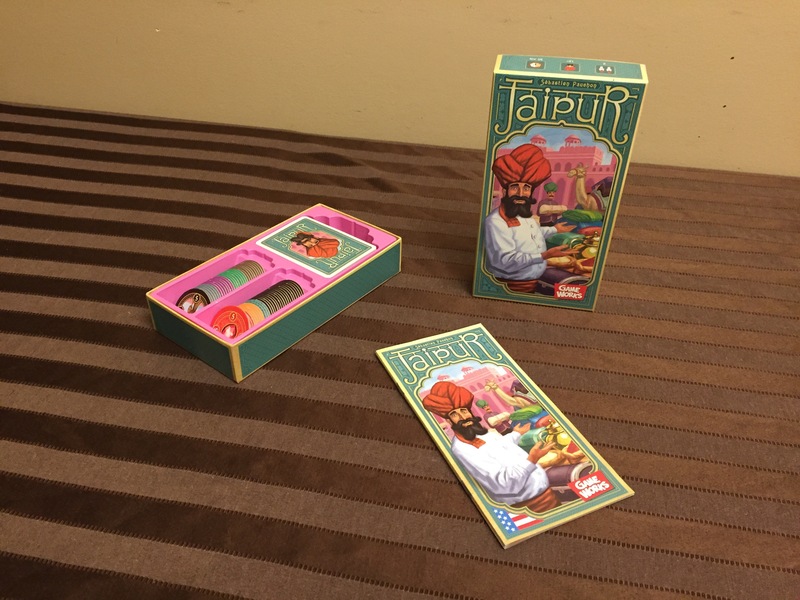 Ok, that sounded a bit harsh but that’s Jaipur, a wonderful card drafting and set collecting game. You and your opponent are merchants trying to buy and sell your wares at better prices and win the deals of excellence to get an invitation to the Maharaja’s court. Inside the box you will get 55 good cards and 60 tokens. I will explain what they all do, but the art is very beautiful and the colours really pop out. Everything fits in perfectly and very functional. 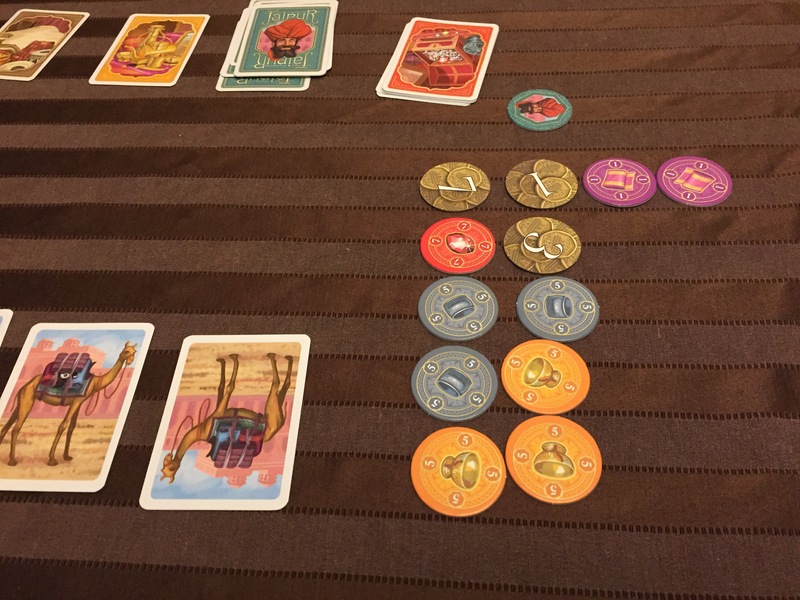 To set up the game, you take 3 camel cards from the deck and place them in the card row. Then you take the tokens and you separate them by good (you have leather, cloth, spice, silver, gold and rubies), and set each good in their own pile in ascending order (lowest number on top and highest on the bottom). Then you take the bonus tokens (with either 3, 4 or 5 on them) and shuffle them and put them in their respective piles. Then you set aside the camel token and the 3 seals of excellence. Then shuffle the deck of cards and deal 5 to each player, and draw 2 more cards and put them with the 3 camel cards to complete the card row, and put the deck beside the card row. There you go! Now you are ready to play! First thing you do when you pick up your cards is see if you have any camels. If you do, you put them face up in front of you. This is your camel herd. 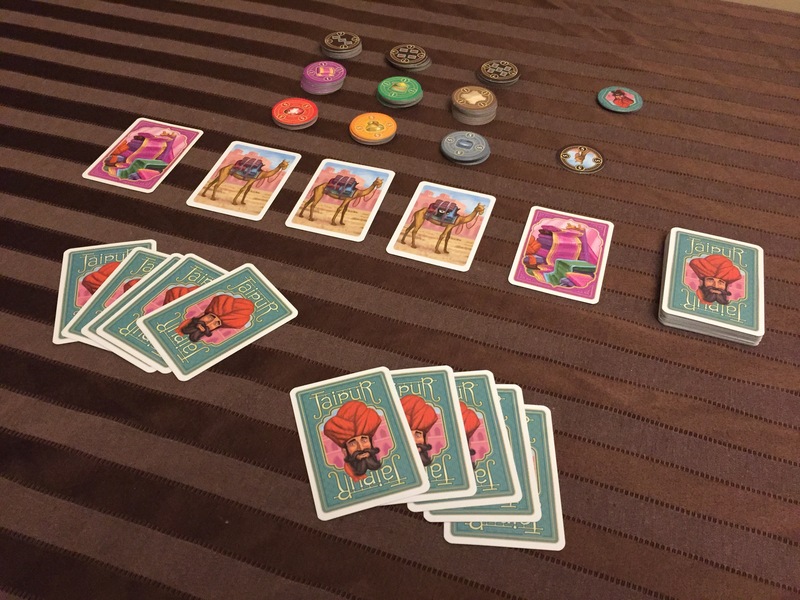 At the end of the round the player with the largest camel herd will receive 5 points. Look at all those precious gems. No cheap wares here! During your turn, you can either take cards or trade cards for points. To take cards, you have 3 options. You can take one single card in the card row and put it in your hand, then replace it by drawing a new card from the deck. If you want more than one card, you can exchange the amount of cards in your hand with the cards in the card row (ex. If you want 3 cards you have to replace those 3 with cards in your hand). Or, you can take all the camels in the card row and put them in your herd (they never go in your hand, and you must always take all the camels) and replace all the camels with new cards from the deck. But keep in mind… you have a hand limit of 7 cards and you may never have more. There is no limit to how many camels you can have in your herd though. Trading for goods works by playing one or multiple cards of the same good from your hand and exchanging them for tokens. You can only sell one type of good per turn, and you can never mix different goods. There are some things to consider. For the 3 “premium” goods (silver, gold and rubies) you must purchase a minimum of 2 tokens. The other rule is when you purchase in 3, 4 or 5 tokens at once you will take one of the corresponding bonus tokens as well (so if you buy 4 spices you will take the bonus token with 4 cards on it). If you sell more than 5 goods, you get the bonus token with 5 on it. The bonus tokens also have an unknown value that you don’t know until you get it, but the more cards you trade the higher the value will be. One thing to consider is as the stack of tokens get lower, the value of the points increase. The game will continue until either 3 stacks of tokens are depleted or you don’t have enough cards in the draw deck to refill the card row. 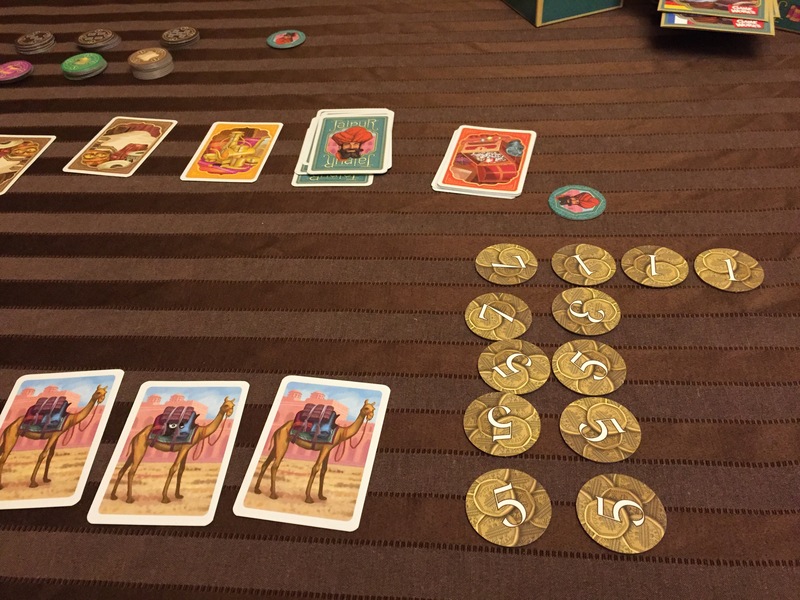 At that point the player with the most camels in their herd gets the camel token. Then, players can flip over their tokens and count their point values and the person with the highest total gets a seal of excellence token. You then play again, and the first person to get 2 seals wins the game! I’m always looking for good 2 player games, and this one just hits it out of the park (or market if you will). One of my favourite mechanics is drafting and this game does it perfectly. Do you take multiple cards but put down cards your opponent might really want? Do you take that card you really don’t need so your opponent doesn’t get it? Do you take all those camels but risk drawing multiple cards with the chance your opponent has a bounty to choose from? Jaipur is full of meaningful tactical decisions. You can buy a bunch of low value tokens knowing you’ll get extra points from the bonus tokens, or buy 2 of the last 3 golds left, leaving your opponents good cards in his hand useless as he can’t just buy one premium good. Don’t play this game with people who get easily offended… you will be constantly getting in your opponents way and that’s just fine. Can’t recommend this game enough.